I’ve always been a reader. My mom loves to joke about how when school would get out the first thing I’d want to do is buy my summer reading books and get started. Not shockingly, when I think back to my summers as a child my favorite memories involve my public library. I used to love going and picking out books, recording them on my chart, and taking said chart to the librarian to “check in.” I remember this with such fondness… it was truly a part of the summer that meant more to me than most other aspects of those 9 glorious weeks of freedom. Now, as a parent, I try to recreate that with my own kids. I signed my son up for the summer reading program and we went religiously once a week. I can’t say he approached this with the same luster I once did…. but he enjoyed the weekly tradition. But let’s think about this. When Landon is left to his own devices he picks a few things…. he chooses superhero books, Scooby Doo books, Fly Guy, and Avengers books. He chooses characters he feels comfortable with and that meet his interests. He really never walks down the “literature” aisles where traditional picture books are kept…. he bee lines for his section. At this point we have read every superhero book the library has… many we have read twice or three times. 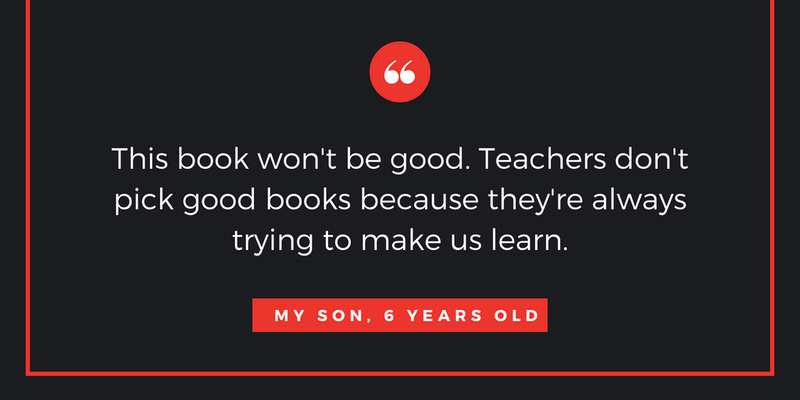 So as teachers, when we cultivate our libraries, are we thinking through the lenses of kids like Landon? Kids who like the familiarity? Kids who want stuff that might be seen as “garbage” or not “real literature”? Are we trying to force a square peg into a round hole to meet our standard of what “good books” look like? Are we providing enough choice and opportunity for all of our readers? I can remember being a new teacher and being told to keep the classics in my library. To shy away from the graphic novels/Diary of a Wimpy Kid/Captain Underpants of the world. I remember hearing people say those books were garbage and they weren’t “real” books. I guess I question then who decides what “real” is. How does one determine what book has value? Because to a kid like Landon, he is going to learn to read fluently by being allowed to explore Fly Guy and similar silly books. Once again my son has taught me a lesson about teaching that I could never learn from my years in college, or even my years as a teacher without the inner insights of a child. He has taught me to see my job as the teacher as more of a provider of a buffet of books, and not a prix fixe menu. He has taught me to expand what options are presented to my students and see through the eyes of a child. He has reinforced to me the importance of taking time to ASK what they want to read rather than selecting it for them. He has reinforced that books aren’t just for learning… they’re also for fun…. and if we want to catch all of our readers, we need to find what they find fun. I laughed a little reading this post as I realized that you are teaching much younger kids, because my first thought when I saw the title was my high school reading list. As someone who was in AP English in my junior and senior year of high school, I didn’t enjoy any of the assigned reading that we had. I think that this played a major role in the huge drop off in my reading for the first few years of college. While I understand that there are things that teachers want and need to teach us and that they use certain books to facilitate that learning, I always wished that we could have used more modern books to achieve the same goal. I personally am not an English major, so I didn’t really hold on to a lot of what I learned in those classes, but I do still love to analyze certain books that I pick up. Honestly though I feel like the only thing my classes instilled in me is a deep dislike of classics and Shakespeare. I really don’t like the idea of certain books being garbage or not worth reading because they aren’t considered literature. I think that kids should be encouraged to read anything, especially when they are young, because so many people’s love of reading falls off around high school when they have to start reading a lot of assigned school books that they don’t like. I think this mind set instills in young readers that there are books out there that aren’t worth reading, and it makes them question why they should have to read what they are told to read in school versus what they actually enjoy. It makes them think that “real” books are boring and uninteresting and so they don’t what to read anything. I think that we should allow young readers to read what they enjoy and try to facilitate conversations with them to help explain the crossing over of themes and ideas that can be found between books to not only help them learn but to make them less afraid of reading more diversely.